A picture is worth a thousand words. It is a cliche, we know, but one that still holds true. Pictures have the power to effect change, spark debates, and sometimes convey what words fail to do. 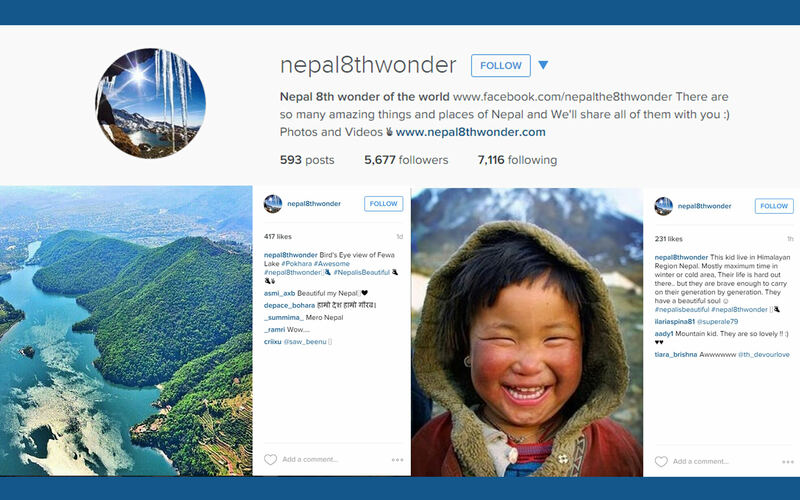 From Namita Rao and Ritu Panchal, here’s a pick of 14 Instagram handles that you must follow if you are interested in Nepal. Some capture how the country is rebuilding itself, others focus on the many wonders of this Himalayan kingdom. Images by Pushkala Aripaka. 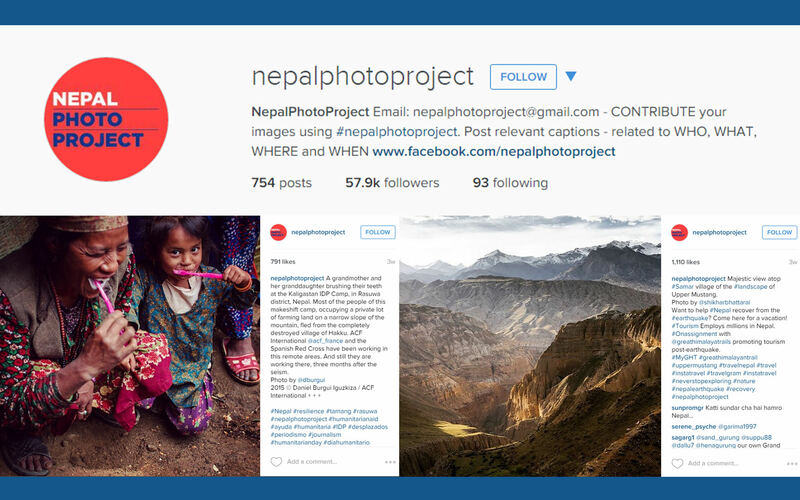 This project came to life in the wake of the earthquake and utilises a network of photographers, all posting with #nepalphotoproject. The photos bring forth raw and purposeful stories of Nepal. From creating awareness of the ground reality to identifying the need gaps that exist, the project goes beyond being just a regular Instagram account. It is a fine example of how visual communication can be used for humanitarian causes. Sachindra Raj Bansi travels across Nepal and in simple yet vividly colourful narratives shares the stories of people who make up this country’s diverse culture. With a recent focus on the rebuilding of the country, his insightful photography captures the nuances of some of the changes that are taking place in the country. Another collective project. 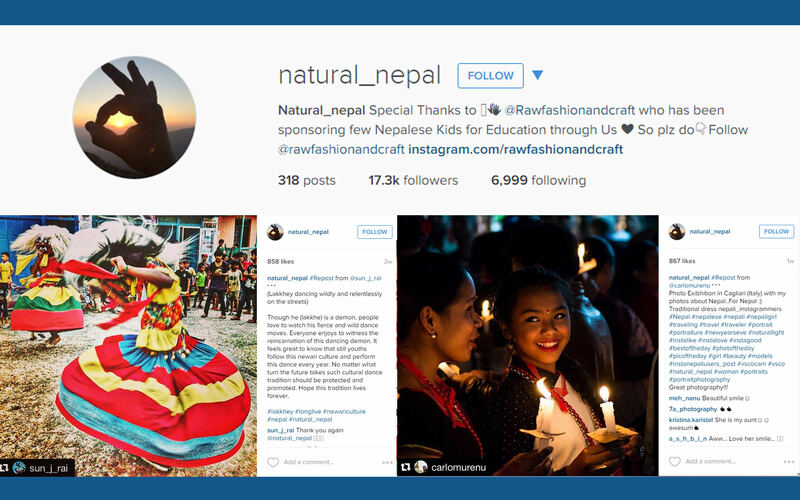 Pictures are sent in by contributors using the #natural_nepal hashtag. The subjects of the photos range from festivals to individuals to natural landscapes, all aimed at promoting Nepal to tourists. 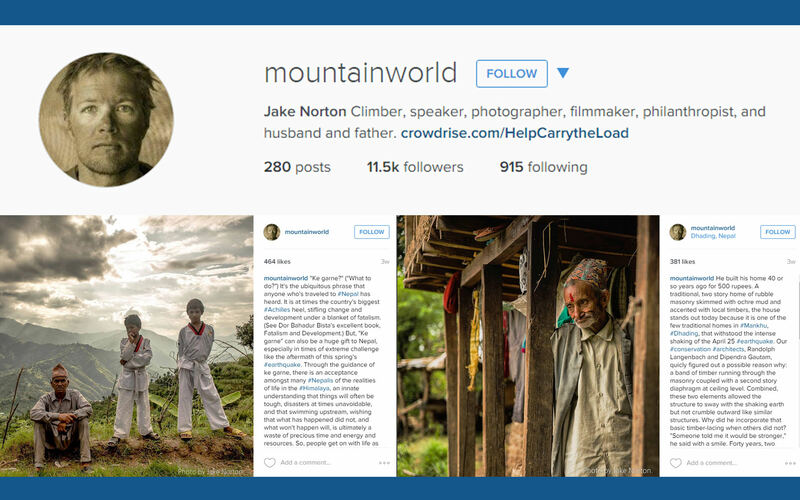 Jake Norton is a mountaineer, leadership trainer, trekking guide, and photographer. Ever since he caught the Himalayan bug at the age of 25, he has returned annually to climb Everest. 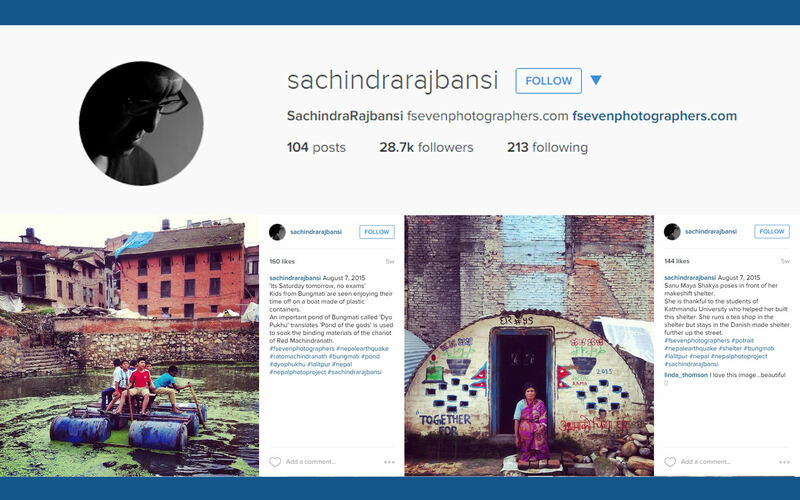 His Instagram features Nepalis recovering from the quake. He also posts gorgeous pictures of the mountainous landscape that is so close to his heart. Through his photos, blog and a crowdfunded project for the rebuilding of Nepal called Help Carry the Load, Norton has been promoting tourism, an industry that employs millions of people in this Himalayan kingdom. 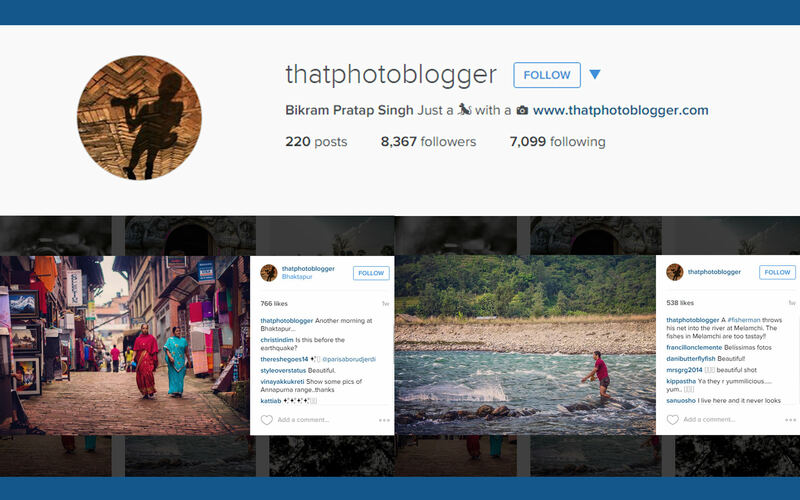 Bikram Pratap Singh is a passionate photographer, an enthusiastic blogger, an avid traveler. His account is a window to the magnificence of the Nepali landscape and culture. Singh is a professional photographer who renders ordinary sights extraordinary. 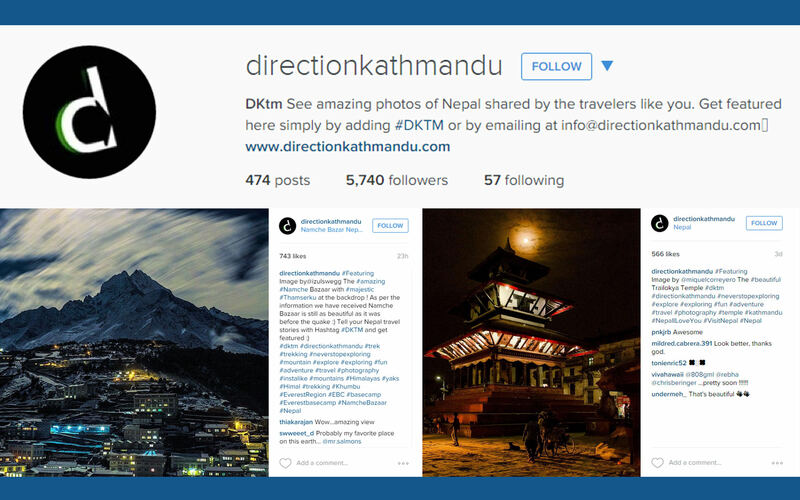 An information website for events and news in the capital, Direction Kathmandu has been actively posting pictures of post-earthquake Nepal on its Instagram page. Contributors are asked to take photos of their surroundings and use #DKTM. Scenic pictures of Nepal along with heritage sites that are being reconstructed are dominant on this page. Focussed on promoting tourism, Nepal 8th Wonder is a page that displays an array of gorgeous pictures of the culture, heritage and landscape of the country. Each picture has a story that beckons travellers from all over the world to visit Nepal and partake in its unique cultural activities. Souls of Nepal is not for the faint-hearted. 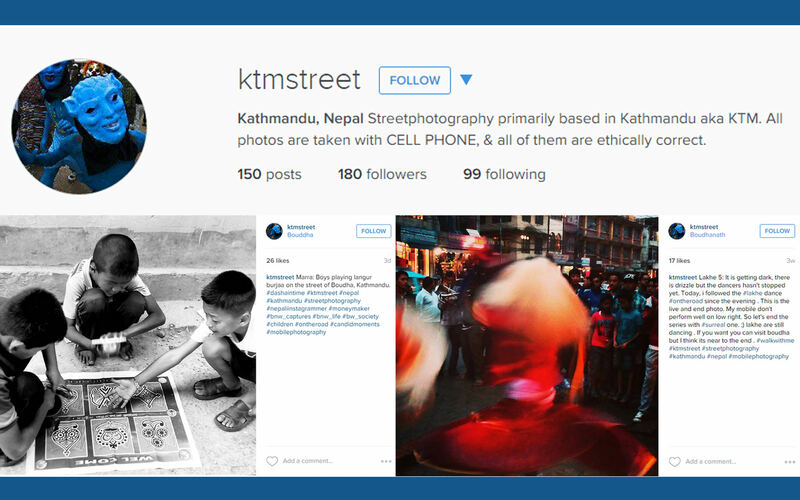 With some extraordinarily powerful images, this account captures the stark adversities that the people of Nepal face on a daily basis. 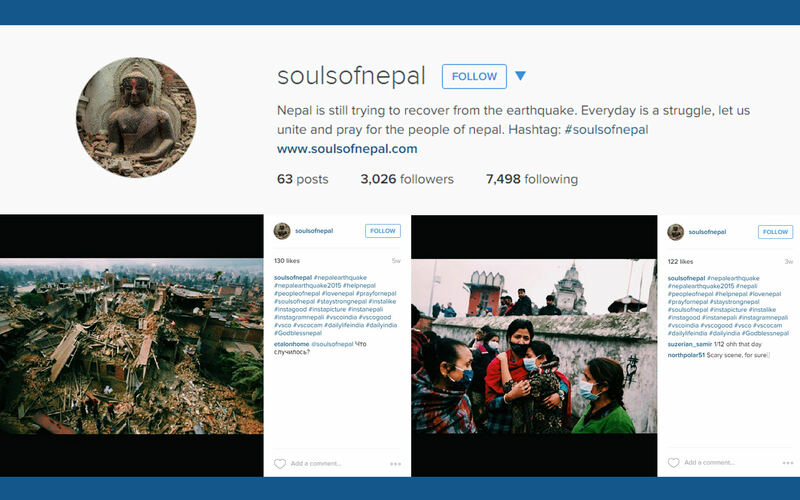 From bleak conditions in refugee camps to soot-covered survivors, Souls of Nepal has posts capable of evoking a whirlwind of emotions. 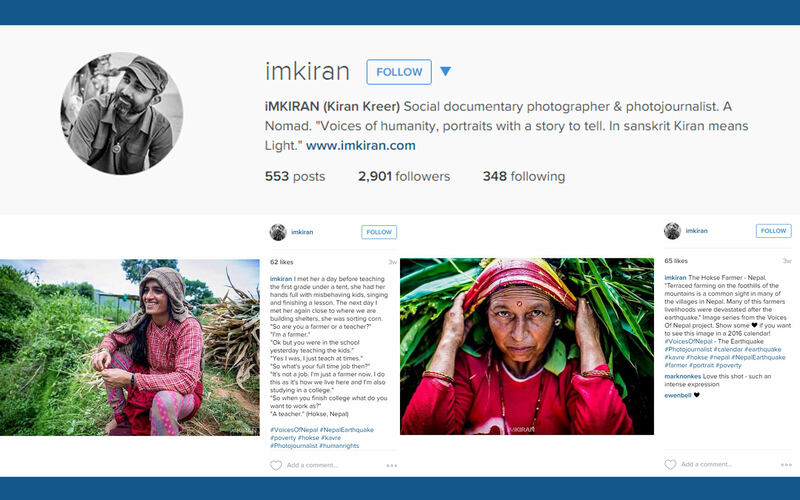 A veteran photojournalist, Kiran Kreer describes himself as a social photographer. Having worked with several other projects which aid the victims of natural disasters, Kiran’s latest endeavour #VoicesofNepal is a series of poignant portraits that are backed with soul-stirring stories of people who have been affected by the quake. Sabinay Pandey weaves magic with his wide-angle lens. Some of his larger-than-life landscape pictures are sure to make you stop and stare in wonder. 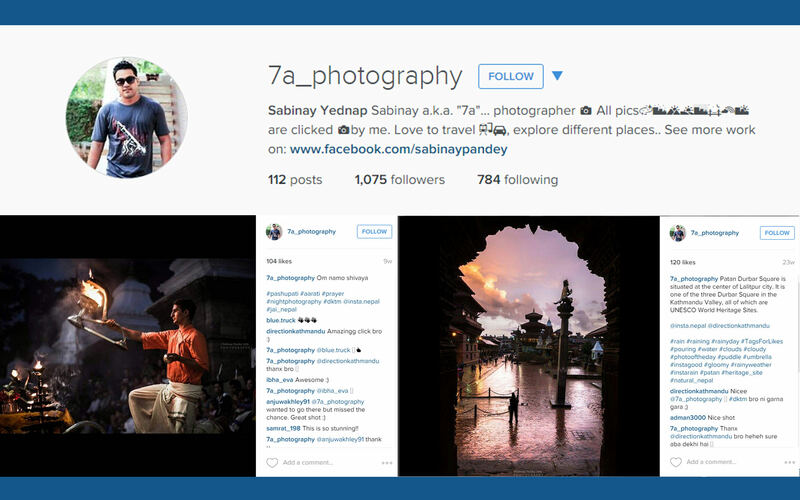 From majestic heritage sites and glimpses of reconstruction to natural marvels and the harmonious pandemonium of urban streets, Sabinay’s pictures are as diverse and incredible as the country itself. 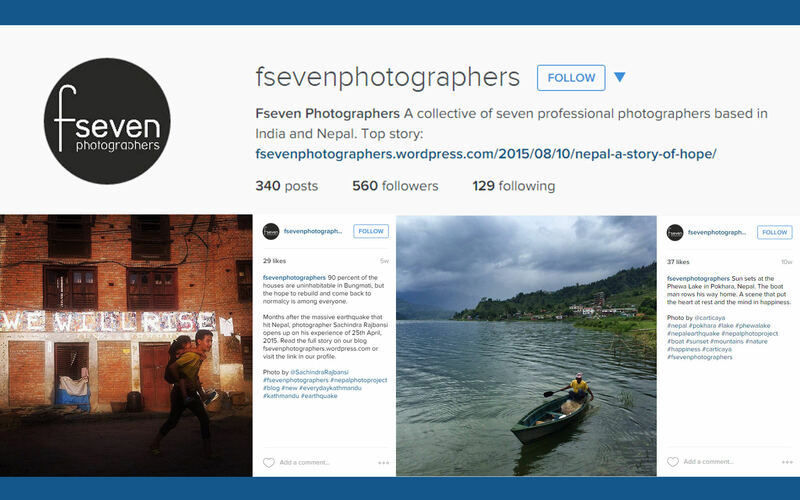 A virtual platform created by seven photographers to showcase their passion for photography, travel and storytelling, F Seven Photographers is essentially a blog, which has a very interesting Instagram account. With most of their photos shot in Nepal and India, this collective shares stories from diverse settings, incorporating an artistic touch that transforms mundane reality into a surreal dream of sorts. 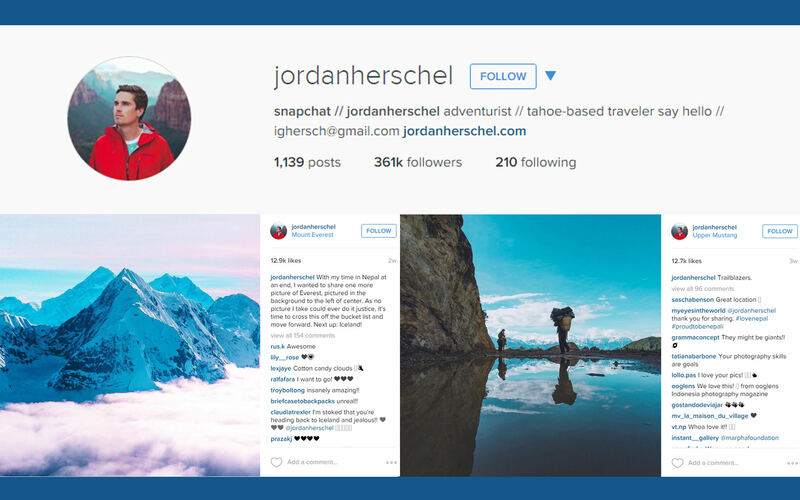 An adventurist and an adrenaline junkie, Jordan travels in search of the memorable. He is currently in Nepal, capturing its splendour. His pictures have a surreal quality to them, reminding you of the grandeur of the Himalayan kingdom. 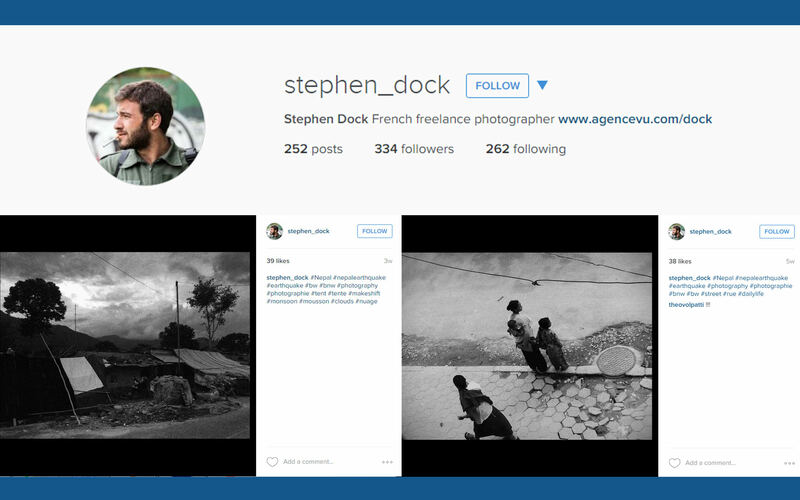 Stephen Dock is a French photographer who is documenting the reconstruction of Nepal. He masterfully uses the interplay of light and shadow to create haunting and elegant monochrome images. His pictures have a feather-light blurriness about them that makes them almost phantasmagorical, finding beauty in wreckage. Ngima Gelu Lama took to the streets of Kathmandu and made it a personal project to tell the world stories of his city. Using a phone, Ngima captures images of the landscape, the infrastructure, the festivals, and the daily gatherings of people that make up the larger reality of the capital. You might also want to check us out on Instagram. Follow!